Today our neighbours from 109 Jameson along with members of Parkdale Organize visited the Forest Hill home of landlords Angelo and Linda Scioscia. We delivered a letter and twenty repair orders and demanded they do the repairs and stop threats of eviction against our neighbours now. 109 Jameson is one of the few remaining mid-rise buildings in Parkdale still owned by a private individual and not a large, financialized company. The building is in serious disrepair. Our neighbours live with infestations of pests (mice, cockroaches), inadequate heat, lack of lighting in stairwells and building lobby, as well as cabinets, counters, windows, doors, and flooring in severe disrepair. When tenants submit repair orders at the building office the landlord responds by charging tenants for repair work and issuing eviction notices. Our neighbour Kelsang recently received an eviction notice for distributing flyers for a building committee meeting. The notice included a bill for nearly $200 for the cost of removing flyers from tenants’ doors. Angelo and Linda were home when we arrived. Linda answered the door. When she saw Parkdale tenants she quickly slammed the door closed. Rather than accept our letter, Angelo and Linda cowered behind their door and called the police. Only after Toronto Police Services arrived did Angelo open the door and begin yelling accusations of trespassing at us. 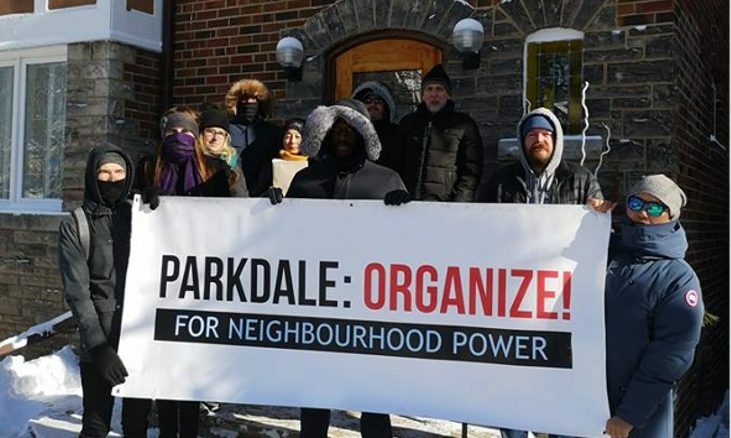 Unless the repair work begins, and eviction notices are withdrawn, Angelo and Linda will face further action by tenants at 109 Jameson and organized working-class people throughout Parkdale who support them. Organizing the working-class and Underclass to fight State/corporate repression and criminality should be the primary goal of any Leftist (talking about the REAL Left, here). So it is actually wholly a secondary issue as to whether this organizing is initially begun by anarchists, communists — or even (some) reformists. However, long-term strategy does matter in the end, eh? And so therefore ultimately, really — also who it is who does the actual organizing. But by all means — just simply organizing people absolutely comes first. So good luck to these people.